The Community Washing, is a System Design project focusing on sustainability - both enviormental and economic. 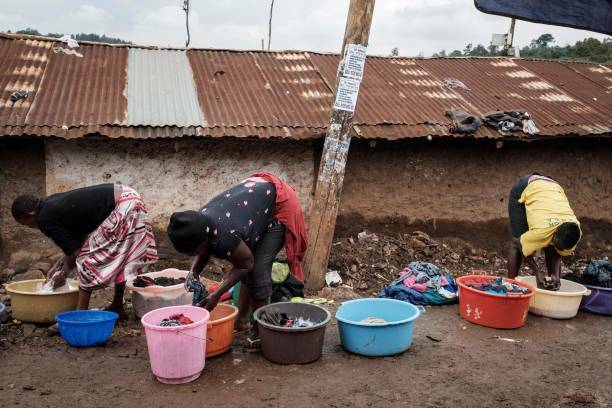 Designed for Kibera Slum in Nairobi, this project piches a community space for washing clothes, which is an important daily task of the women here, while preserving their space to socially connect, and also lessening work load. This solution was meant to fit in seemlessly into the cultural and socio-economic context of Kibera, while still bringing something new and improving into the system. Concentrating on the activity of clothes washing, this solution aims to keep the traditional value of this being an occasion for women to socialise, while reducing their effort in the task itself. Also in the hope of enabling male members of the society to come ahead and help in a task that has traditionally been only a woman's labour. Another very big factor is the lack of water and space, and limited electricity in Kibera. How these factors are cleverly used is also a challenge that had to be met. Therefore, above everything, utilization of very limited resources, and help from the local governing bodies, where two very essential variables in the system that limited what can be implemented successfully as a proposed solution. A community washing station, an obvious solution, had to be customised such that everything form the building itself, to the spaces and purpose has to fit right into the context of Kibera. Even though this solution originates in the western world (first one opened in the US in 1934), tweaking some essential details made it a seamless fit in the system we were trying to enhance. The Washing station is proposed to be built on the edge of the Niarobi/ Mataoine River, so that there isn't much energy wasted in pumping water to the station. The building itself is to be built using local materials and labour, and to be designed using the traditional Kenyan architectural knowledge. The electricity for the running of the machines is to be derived from the ever present sunlight available in the region, by fitting a concentration of solar panels on the roof of the building. The machines are to be leased from a major washing machine manufacturer, so that they are also owned and maintained by them. Provided to Kibera as a part of their CSR. The soap for washing, is to be sourced from a local manufacturer of soap with natural materials (so the grey water can be used directly). 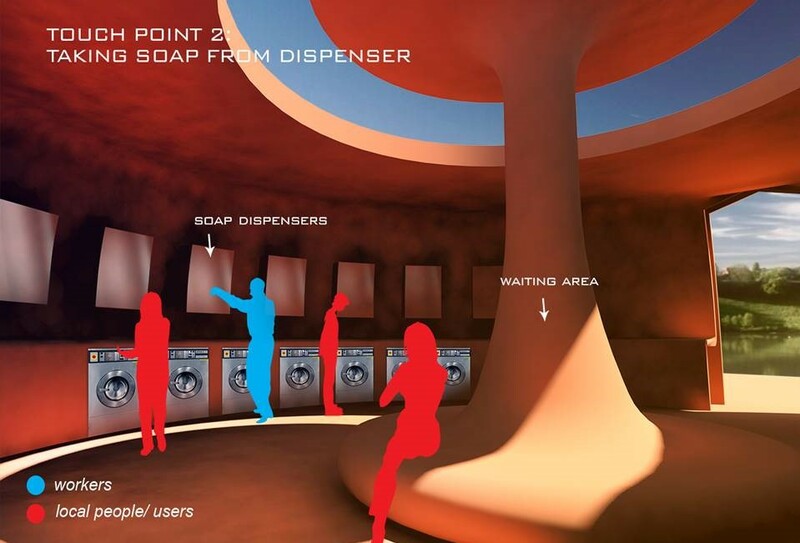 There would be soap dispensers installed around the machines, making sure to dispense only one unit of soap per wash cycle. The water used for washing clothes, is to be re-used to water a green park developed aroud Kibera area/ around the washing station. THe roof will also have water collection capacity, in order to capture at least in part the abundance of rainfall the region recieves.